In 1951, when I was artistic director of a small ballet company attached to the National Theatre of Wiesbaden, I wrote this psycho-chamber-jazz ballet for it. It was never staged because the company dissolved before we could put it on. I conducted the score in a concert on the Darmstadt-Frankfurt a.M. Music Festival on May 29th, 1952. I. Permanent Menace: Adolescents of Knossos under the threat to be fed to the Minotaur. II. Cantus choralis: Plea to Theseus to kill the monster. lll. Conflict: Ariadne tries to prevent Theseus from facing the dangers involved by going into the Labyrinth and challenging the Minotaur. But Theseus is adamant. IV. Variation: She invents the device of the thread stuck to Theseus, made to pull him back out of the Labyrinth in case he would get lost in it. V. Minotaurus Blues: Theseus in the Labyrinth fights the Minotaur and kills him. VI. Fantasy in Rose: Theseus and Ariadne happily reunited among the people of Crete who are grateful to be liberated from their nightmare. Having fallen from the public eye in Britain in recent years, Hans Werner Henze basked in the limelight of this two-day tribute involving the BBC Symphony Orchestra and the Frankfurt-based Ensemble Modern. With two substantial UK premieres, plus a cross-section of symphonic, piano and vocal music, the weekend did credit to everyone – not least the 83-year-old composer, looking frail but alert as he stood to acknowledge the hefty applause. What the weekend revealed, surprisingly for a man who has been waylaid by so many political and personal distractions, was the consistency of Henze’s musical personality, from the precocious Variations for piano solo to the opera Phaedra . Written 60 years apart, both speak of a bounteous fluency and love of lyricism, harmonically advanced yet never far from a tonal base, that no other living composer has matched. None of the works we heard represented Henze at his best, but all underlined how diligently he has extended classical tradition. That was as evident in his 1999 symphonic essay Fraternité – an unusually taut and seamless argument – as it was in Elogium musicum , written last year in memory of his long-time partner. Despite being a product of Henze’s old age, this Stravinskyan cantata is no sentimental farewell. After a first half dominated by a barren lament and a Dies irae -like blast of bitterness, the second half celebrates mankind’s kinship with nature and ends with a pantheistic Mass of Life. Oliver Knussen, conducting the BBCSO and Chorus, proved an exceptionally lucid guide – more so than in the enigmatic Fourth Symphony, which, like much of Henze’s music, loses its way in a forest of over-fertilised argument. A selection of piano pieces, pungently performed by Huw Watkins, showcased a rich and undervalued part of Henze’s output. Phaedra , by contrast, aroused mixed feelings. An 80-minute dramatic fantasy, magically scored for chamber ensemble, about love, mortality and the unstoppable dance of life, it has wonderful moments, including an earthquake interlude. But not even this charismatic performance under Michael Boder, with a cast headed by Maria Riccarda Wesseling, John Mark Ainsley and Marlis Petersen, could redeem the opaque narrative. The BBC’s annual “Total Immersion” events focus on the work of one composer:you can hole up inside the Barbican for almost 12 hours at a stretch, listening to concerts, viewing documentaries and attending talks. Hans Werner Henze was a good choice for this year’s Immersion. He’s Germany’s most famous living composer, scandalously underplayed in this country, and his output over a 60-year career is prodigious. But by the end of the main evening concert I wondered whether three hours of Henze really gives you significantly more than 20 minutes. Any of Henze’s pieces, even the little piano works played with such lucidity and tenderness by Huw Watkins, have the effect of a “Total Immersion’’. They overwhelm you with their emotional heat, their burgeoning contrapuntal tendrils, their luxurious revelling in the phraseology of old music (one piece, Cherubino, was like a compendium of Mozartisms, seen through a heat-haze). 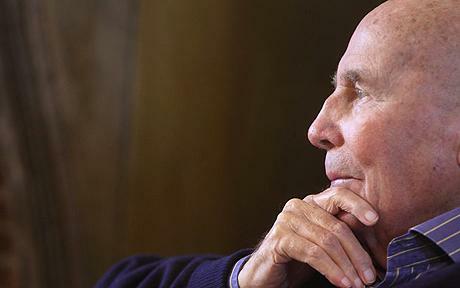 Ahead of the Barbican’s day-long celebration of his life and work, composer Hans Werner Henze talks at his Italian villa .